** Update** I was writing you a message about what we did to De-Fund the Dakota Access Pipeline (# DeFundDAPL) is working. And then Trump’s Army Corps of Engineers announced that they were ignoring the law, tribal sovereignty, US treaties, and common decency to ram through the Dakota access pipeline. In response, I’m encouraging everyone to join the massive “last stand” day of action happening today. Dozens of events are already planned around the county – Find yours and show up today. And then stay tuned for more info on how we can stop this pipeline. Last week we announced that over 700,000 people, representing over $2.3 billion (with a B), were ready to move their money out of the 17 banks funding the Dakota Access pipeline. Boy, did we get their attention. In the las week, Danish bank DNB has agreed to stop financing DAPL unless they re-route or cancel the pipeline in accordance with the Standing Rock Sioux Tribe’s wishes. Citibank, Wells Fargo, ING and more have all agreed to meet with indigenous leaders and our coalition to try and de-escalate the situation. And maybe the best news of the week, the City of Seattle voted to divest another $3 billion dollars from Wells Fargo – one of the lead banks financing DAPL.But it doesn’t just SOUND good, our activism LOOKS good too! Check out some of the highlights in this twitter collection, with more photos and videos below. All of this advocacy is having a huge impact on the banks, and on the entire pollution for profit industry that includes companies like Energy Transfer Partners and Sunoco logistics. After a committee of Seattle’s city council voted to divest from Wells Fargo, the University of California in Los Angeles followed suit, and there are already reports that dozens of other cities are planning to do the same. And the pipeline companies are taking notice: News reports indicate that the biggest pipeline companies in the U.S. are panicked right now – trying to figure out how to move forward with their projects in the face of our unrelenting protest and divestment. They’re planning sophisticated P.R. campaigns, trying to buy off landowners, and trying to get Trump’s regulatory team to approve their plans without public engagement. All of which tells us something important: Protest and Divestment work. Your actions have been effective this week, and so we’re planning even more of them. Because DAPL isn’t stopped, yet. The Army Corps of Engineers is still accepting public comments on the projects environmental impacts, and just last week there was a violent crackdown in South Dakota to clear the newly-established Lost Child Camp, that was located immediately across the road from the main entrance to the Oceti Sakowin camp. This fight isn’t over yet, and we need your support to keep it going. If you can, please consider chipping in to support the legal defense fund for Chase Iron Eyes and other water protectors arrested in last week’s raid. And stay tuned for more emails from 198 this week about how you can stand with Standing Rock and #DeFundDAPL. I think that this is disgraceful and they need help. ALL – people and natura – HAVE RIGHTS! Donald Trump has incited terrorism within our country; he and his administration must be stopped!! These pipelines need to be stopped and replaced by another method of transfer. No more crossing our country to oil profits. I have already withdrawn all my money from US Bank. Keep up the good work! thanks! 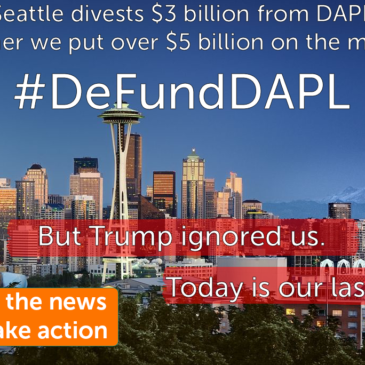 don’t forget to report your withdrawal at defunddapl.org so we can show the banks what they’re losing!